Mesa County, Colo. -- Friday afternoon, a deputy conducted a traffic stop on Interstate 70 eastbound near mile marker 15 (Loma area). In the spare tire of the vehicle, deputies located 7 pounds of methamphetamine which has a distribution value of about $90,000 and a street value upwards of half a million dollars. The driver of the vehicle Manuel Campos, 30, and the passenger, Irvin Torres, 25, are both from Los Angeles. They were booked into the Mesa County Detention Facility on one count each of felony possession with intent to distribute methamphetamine and special circumstances importing methamphetamine. Manuel and Irvin are each being held in jail on a $50,000 cash only bond, with their next court appearance scheduled for December 4, 2015, at 8 a.m. Yesterday evening, patrol deputies conducted a traffic stop in the area of 29 1/2 Road and Orchard Ave., Grand Junction, after deputies witnessed the driver of a vehicle drive up onto the sidewalk in an unsafe manner. John Bruno, 37, of Centennial was the driver of the vehicle and Sean Alexander, 41, of Grand Junction was the passenger. John was arrested and booked into the Mesa County Detention Facility on charges related to careless driving, driving the vehicle on the sidewalk, possession of a weapon by a previous offender, no insurance and improperly displayed license plate. John is a convicted felon from a 1997 case and therefor is not allowed to have any firearms, and yet he claimed ownership of a muzzleloader and accessories he said, he recently purchased. Sean was arrested and booked into the jail on one count each of possession of methamphetamine and possession of drug paraphernalia after more than 8 grams of packaged suspected meth was found in his coat. John received a $5,000 PR bond and Sean received a $1,000 PR bond. Both men are scheduled to appear in court next on December 8, 2015, at 8:30 a.m. Their booking photos are not currently in the system but will be updated here when they do become available. For updated information on any inmate currently in our Detention facility, visit our Inmate Inquiry System website. Mesa County, Colorado—The Mesa County Search and Rescue Ground Team is currently accepting applications for four new members (they are limiting the number of new members, at this time). All prospective members must first complete an application. Applications can be picked up at the front counter of the Sheriff’s Office during business hours or printed off our website. Please note, anyone interested in becoming a new member must pass a background check and will have to go through an interview process. The deadline for turning in applications is Thursday, December 31, 2015. For more information, questions or inquiries, please contact Doug Sieckert by calling (970) 234-0763 or email: dls63@yahoo.com. Mesa County, Colo. -- In the early afternoon yesterday, investigators with the Western Colorado Drug Task Force using a trained K-9, in the detection of drugs, to inspect luggage from a Greyhound bus at the downtown Grand Junction bus station. The bus originated in Los Angeles with a final destination of Chicago. Two adults were arrested on charges stemming from a kilo of cocaine and 8 ounces of heroin, found in luggage corresponding with two passengers from the bus. Kerstin Nguyen, 22 and Eric Johnson, 33, both of Michigan, were arrested and booked into the Mesa County Detention Facility on three felony charges related to distribution amounts of cocaine and heroin. In addition, Kerstin was charged with first degree introduction of contraband into the jail, after heroin was located inside her bra during the booking process. Bond amounts for both will likely be set by a Judge today, visit our Inmate Inquiry System webpage for updated information on any inmate currently in our facility. A booking photo of Eric is not available at this time, but it will be posted here when it does become available. The Western Colorado Drug Task Force is a partnership established in the early 1980’s between the U.S. Department of Justice Drug Enforcement Administration, the Grand Junction Police Department and the Mesa County Sheriff’s Office. The Task Force is designed to fight the battles of drugs on the frontlines and other crimes that go with dealing and using drugs. Grand Junction Police Chief John Camper and Mesa County Sheriff Matt Lewis agre this Task Force is effective and nationally competitive in the law enforcement field when it comes to knowledge, experience and teamwork. The Drug Task Force provides a refined level of service to the law abiding citizens of Mesa County and across the Western Slope. Mesa County, Colo. -- The owner of a mobile home listed for sale requested deputies to the 2900 block of North Avenue, Grand Junction, yesterday after finding people living in the home without permission. Deputies located two adults inside the trailer, along with needles and methamphetamine in the bathroom. Joshua Melton, 31, and Danielle Adams, 24, both of Grand Junction were arrested without incident and booked into the Mesa County Detention Facility. They were booked on charges of first degree criminal trespass, possession of meth and possession of drug paraphernalia. Joshua and Danielle remain in jail awaiting a bond to be set. Bond updates can be found on our Inmate Inquiry System webpage for any inmate currently in our facility. Mesa County, Colo. -- Recently, deputies were called to the 3400 block of F Road, Mesa County, for a felony menacing. The residents of the home had been confronted by a man they knew to be Nicholas Ortiz, 28, of Palisade, who had in his hands a loaded AK-47 rifle. Deputies located Nicholas and the loaded rifle, along with a small baggie of methamphetamine and a glass pipe, commonly used for smoking meth. 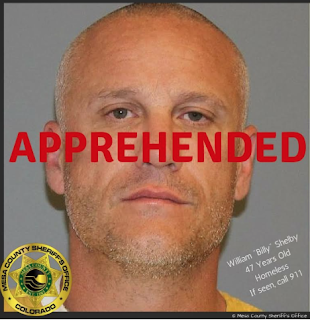 Nicholas was arrested without incident and booked into the Mesa County Detention Facility on felony charges related to the rifle, drugs and paraphernalia. He has received a $25,000 cash only bond and remains in jail, at this time. For updated bond information on any inmate currently in our jail facility, visit our Inmate Inquiry System website. Mesa County, Colo. -- Deputies conducted a traffic stop on a vehicle in the area of 30 Road and Texas Avenue, Grand Junction, yesterday. Ultimately two adult women were arrested and booked into the Mesa County Detention Facility on drug related charges. Tiera Miracle, 25, provided deputies with a fake name initially which resulted in a felony charge of criminal impersonation. Hydrocodone prescription pills, along with total package weight of 6.2 grams of meth were located in Tiera's purse. In addition to criminal impersonation, she was also charged with possession of methamphetamine, possession of drug paraphernalia, first degree possession of contraband, and she had an active failure to appear warrant out for her arrest. Karly Ogburn, 19, of Clifton, was the driver of the vehicle stopped by deputies. More than 4 grams of total packaged weight of suspected meth was located in the vehicle she was driving, without a valid driver's license. Karly was booked into the Mesa County Detention Facility on charges related to possession of meth, possession of drug paraphernalia and driving with a denied license.